Menstrual Cup Dangers: Is There Lead or Cadmium in My Menstrual Cup? UPDATED 2/25/2018 to include current information available about the LENA menstrual cups, Diva Cup, Luna cup and Angian EvaCup. Posts linking to product provided for informational purposes may be affiliate links. Tamara, The Lead Safe Mama broke the internet again! This time it was over menstrual cups. People have been asking us to test their Diva Cups, LENA menstrual cups, Lunette cups, Luna cups, EvaCups and more for lead, cadmium and other heavy metals for the last six months or so. 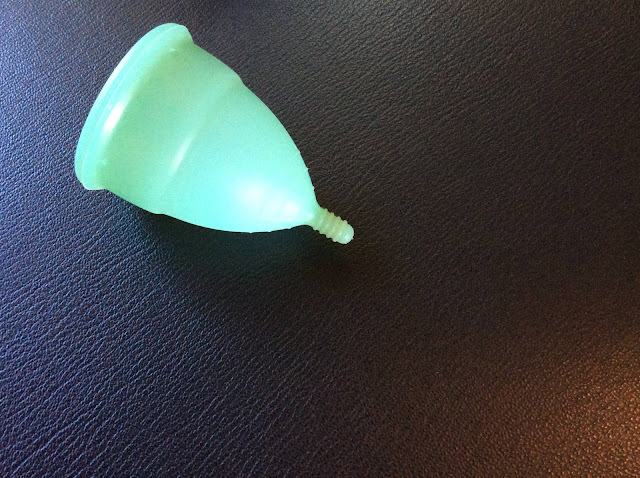 In February, while doing a healthy homes visit, she had a chance to test two different menstrual cups from LENA, the Diva Cup, a Luna cup and an Angian EvaCup. The instrument that Tamara uses to test items for heavy metals is a non-radioactive source XL3T x-ray fluorescence spectrometer (XRF) from Thermo Fisher Scientific. It tests for precise amount of heavy metals like lead, cadmium, arsenic, etc with accuracy in the single digit parts-per-million (PPM). This instrument is the industry standard for field testing and is what the Consumer Product Safety Commission uses to test for heavy metal contamination. 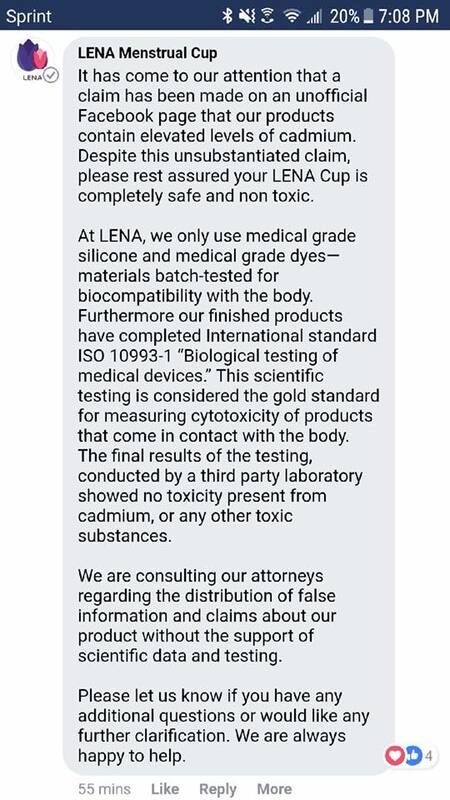 Do the LENA menstrual cups contain lead or cadmium? Tamara used the XRF to test two different LENA menstrual cups. For accuracy she conducts multiple tests in different areas of the product for a minimum of 60 seconds. Here are the results of the two LENA cups she tested with links showing the type of cups tested. This pink LENA menstrual cup tested positive for cadmium at 22 PPM +/-7. It did not detect any lead, arsenic, mercury and other heavy metals. This blue LENA menstrual cup tested positive for cadmium at 19 PPM +/-7. It did not detect any lead, arsenic, mercury and other heavy metals. Does the Diva Cup contain lead or cadmium? A week later, Tamara was able to test a used (but clean!) Diva Cup. The cup she tested, tested positive for cadmium at 17 PPM +/-4. While this is slightly less cadmium that seen in the test results for the LENA cups, and lower than the strictest regulatory standards for toys (40 PPM for cadmium) - both Tamara and I are concerned that this much cadmium is present at all in an item intended to be inside your body for such an extended period of time - especially so close to such a vital feminine organ. I have personally been a dedicated Diva Cup user for almost eight years now and am pretty disappointed about these results. Does the Luna Cup contain lead or cadmium? The next cup tested was a Luna cup. This cup has tested for the lowest amount of toxicants out of all the cups tested so far with test results of 11 PPM cadmium +/-4 (non-detect for lead, arsenic or mercury). Tamara wrote about this on the Lead Safe Mama website. Click here to read her detailed write up about this cup: #LeadFree Luna Cup, purple. Does the EvaCup menstrual cup contain lead or cadmium? Tamara did two extended tests on the EvaCup, the results of which average out to 15 PPM cadmium (no lead, arsenic or mercury detected). Read her much more detailed write up about this cup on the Lead Safe Mama website here: #LeadFree: Green silicone Eva Cup. Why is there cadmium in my menstrual cup? When cadmium is present in small amounts (under 40 PPM or so), it is not because it was added to the silicone mix on purpose. It most likely piggybacked in with the raw materials used to make the silicone or the pigment used to color the silicone. None of these companies are intentionally putting cadmium in their menstrual cups. While the amounts present in the cups tested are considered safe by all regulatory standards, I think it is worth noting that it is absolutely possible to make silicone without trace cadmium contamination as have been proven by the consistently cadmium free readings (ND with an XRF) on the silicone parts contained in Life Factory baby bottles, Avent baby bottles, and the Safe Sippy 2. Why aren't these companies sourcing cadmium free silicone? I'm not sure but I hope they will consider that change going forward! What is a safe amount of cadmium to have in silicone? This question is trickier. In the United States (where both Creative Green Living and Lead Safe Mama are based), the most stringent standards for heavy metals in items are reflected in legal standards for heavy metals in toys. As far as I am aware, there is no heavy metal standards for cadmium in medical grade silicone but I did call the FDA to ask about it and am still waiting for a call back. I will update the information in this post if I discover more information about that. We (Tamara and myself) generally consider 40 PPM cadmium the "level of concern" for cadmium in items like dishes, mugs, toys, etc but some women have expressed concern regarding cadmium in an item placed so close to your uterus - and we don't disagree with them. I know for myself personally, I want a menstrual cup that can prove it has ZERO lead, cadmium or other heavy metals in the silicone. "An unofficial facebook page": Lead Safe Mama is, indeed an official facebook page for the website run by Tamara Rubin. Tamara is also the director and producer of the feature length documentary, MisLEAD: America's Secret Epidemic. She is a trained and certified XRF operator and is widely regarded as the foremost expert on lead in consumer goods in the USA. "elevated levels of cadmium": Anything under 40 PPM cadmium is actually considered "trace levels of cadmium." Concerning? Yes. Elevated? No. (also, nowhere did Tamara state there was an "elevated level of cadmium" in the cups - that is LENA's language). "No toxicity present from cadmium..." I don't doubt their testing showed no toxicity present. I will say that I as a consumer, though, that I have a strong preference for a cadmium free product rather than "no toxicity from cadmium" or a "does not leach cadmium" product. "We are consulting our attorneys": I will be really curious what the attorneys say. Tamara made no inflammatory claims or even any claims about toxicity. She simply stated what the PPM of cadmium found in the cup she tested was. I'm not sure how you can argue with that! What should these companies do? These companies (especially LENA) need to listen to what their customers are saying. The customers that just contacted them concerned about cadmium? They are telling them what they want. They want cadmium free menstrual products. Not products that are "good enough." Not products that don't show any leaching when brand new. Products that are CADMIUM FREE. Many of these consumers chose to opt out of tampons to avoid glyphosate and all the other toxic crap that came with them. They don't want their next choice to contain any heavy metals. They don't care that the testing showed the heavy metals to be "unconcerning" because when it comes to items we put next to our baby factories, trace amounts matter. As for me personally, I am temporarily switching to Natracare organic tampons while we continue this investigation into heavy metals in silicone menstrual cups. I am on a search for a cadmium free menstrual cup and I'm sure I will shout it from the hilltops if and when I find it! The best way to be kept up-to-date on breaking news like this is to join the Creative Green Living community group on Facebook. Carissa is a green lifestyle advocate and mom of two active boys. The owner and lead writer for Creative Green Living, she is also the author of several e-books as well as the hardcover cookbook, Beautiful Smoothie Bowls (Skyhorse, 2017). Her goal is to empower families to make easy projects and healthier choices that are beautiful and delicious! Follow her on Pinterest, Instagram, Twitter or join the Creative Green Living community group.